The house gets damaged in long run and various issues occur in foundation which range from development of cracks, walls caving in, water seeping or water leaking in courtyard, cracks in foundation and irregular floors. In order to maintain the longevity of the house, the repairing work should be started immediately. A house is mainly based on foundation and if issues arise with foundation, proper care should be taken. Wall Anchor Systems: When the walls of the building protrude, caves in or slide at the bottom, it indicates that the pressure on side walls is raised. To get rid of the issue, it is useful to apply wall anchor systems to provide support to the damaged wall and it neutralizes the pressure and settles the wall and even provides support to walls. It can be adjusted based on the specifications of the building. The wall anchors can be set up instantly and finished in a day. Crawl Space Support System: Crawl space support system provides support to the sagging floors and undersized beams recovering strength as well as straighten the beams. It rectifies the sloping floors, interior wall cracks and door to door levelling. Pier Systems: The purpose of pier systems is to resolve issues with settling foundations and it redresses different types of settlement issues like horizontal or vertical cracks, sinking slab floors, jamming doors and windows etc. The product can be set up instantly and helpful with minimum noise disturbance. Mud Jacking: Mud jacking refers to a method that adjusts the sinking slabs of patios, walkways, driveways and concrete steps. The mortar mix is injected among the layers to avoid sinking of the base and it is layered in the empty spaces and after getting solidified, it elevates the slab. Structural Support Jacks: The objective of structural support jacks is to repair sagging crawl space and recovers the structure to original shape devoid of reconstructing it. It adjusts sinking crawl space supports, imperfect structural design, rotting floor beams and foundation failure. 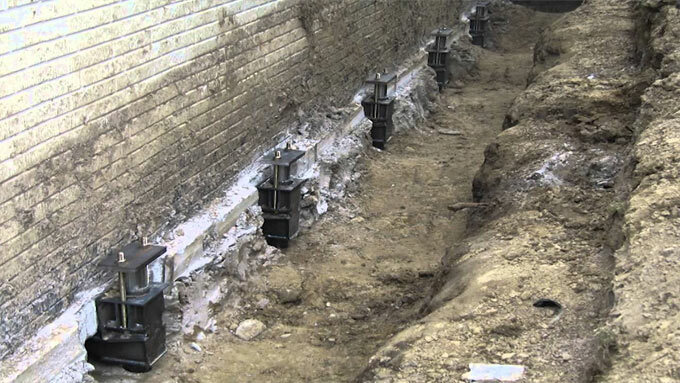 Foundation Replacement: For replacing the entire foundation, the soil is excavated from the foundation and the adjacent areas and the house is jacked up on temporary setups. New foundation is constructed and house is lowered to recover on the foundation and other spaces are repaired as much as possible. But, the process is costly and laborious. Commercial Helical Anchors: Commercial Helical Anchors offers sound lateral strength to foundations and balances the structure against the pressure of earth. The installation method is simple and it can be set up all the year round. The load strength can be discarded once the installation is finished. Repair of Sinking Concrete Floors: There are two systems to repair the sinking concrete floors which range from slab pier system and lifting settled floor by injecting high density expanding foam underneath the slab that fills the empty spaces inside and it uplifts the structure back to its original position. Steel I-Beams: The purpose of Steel I-Beams is to modify when foundation walls start bending or caving inside so that the walls are not collapsed in near future. Steel I-Beams settles the foundation wall and resolves the issue. Repair of Street Creep Issues: Street creep belongs to a foundation issue that happens because of enlargement in heat and contraction in winters. The empty space is formed and the joints crack and debris get through the spaces thus it fails to keep its original shape in contraction. Street creep is rectified with the process of Wall anchor system.